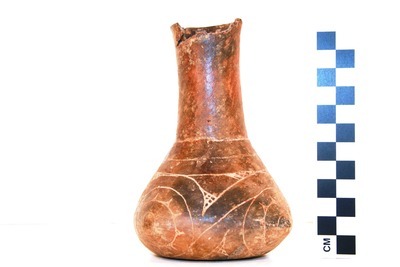 "41CP12, Burial 19, Pot 10" by Timothy K. Perttula and Robert Z. Selden Jr.
DECORATION: There are three horizontal engraved lines on the vessel body below the neck. Below these lines is a scroll and circle motif repeated four times on the body, centered on the body peaks. The central circles have two inner engraved circles, one of which has large triangular tick marks on it. There are sets of two engraved triangles above and below and to the side of each circle element; these have one or two hatched or cross-hatched corners. A red clay pigment has been rubbed in the engraved lines. Ripley Engraved, var. unspecified bottle, Burial 19, Pot 10.